Drawing the figure, we will work solely in black and white with charcoal on paper. The intent is to concentrate on the value patterns, de-emphasizing the use of line as the primary means of delineation. 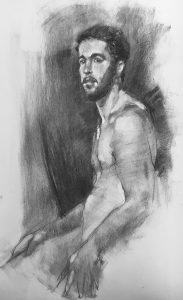 This will simplify the drawing process into semi abstract interlocking shapes of light and dark, and help overcome some of the pitfalls we all encounter drawing the figure. These shapes are easier to identify and record than line descriptions of concepts such as hands or eyes. Following the great western tradition, we will be utilizing undraped figure for our studies.